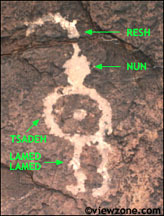 The enhanced digital image above is a portion of a 60 foot long petroglyph that is located on private land. Known as "Bear Rock Canyon," this location has been regarded as containing one of the most significant clues of the ancient authors. The petroglyph is carved along a stretch of canyon wall, some 18 feet above the present day floor. It reads from right to left and is believed to have a picture of a large ship, with sails and rigging, on the extreme right (just out of view in this image). 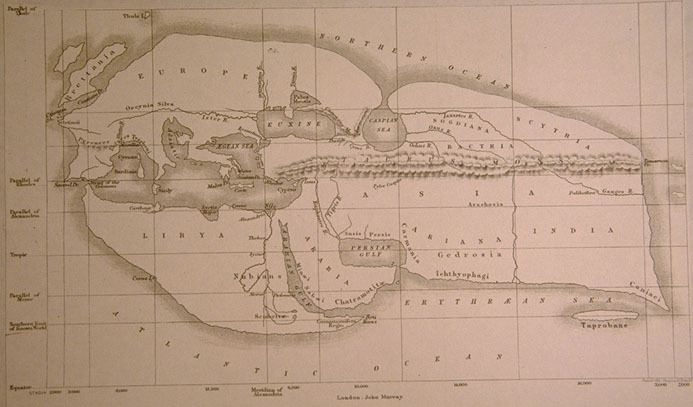 Many believe that this petroglyph tells of a journey by sea and land and could possibly reveal some valuable information as to when and where the authors came from in the Old World. On the lower right can there is what appears to be a ship's hull with the letter Mem sitting inside the outline. Mem, appearing alone, is interpreted as meIM, or "from..." Thus, it would appear that the adventure time-line begins with leaving the boat or ship. Skipping to the next complete ligature, we read (top to bottom) Yod-Resh, yeRI, "shooting fire..." which is emphasized by the deeply engraved image with rays coming from it to the right. This appears to be some sign - perhaps a comet or some celestial lights - that were seen following embarking from the ship. The vertical line and the horizontal line in this ligature still pose some problems in translation. The horizontal lines resemble the arms of a figure. Each even terminates in five radiating lines that resemble fingers. However, the line to the left continues to form the "time line" that spans the entire 60 foot petroglyph. The next recognized shapes are made of an Alef+Tsadeh-Tsadeh. The concentric circles are the letter Tsadeh repeated to indicate a word termination. ATS, "quickly, with haste..." To the left of this grouping there is another set of concentric circles which will be read, Tsadeh-Tsadeh or "appeared..." The bottom of this ligature contains a tightly coiled Shin followed by an inverted Chet, to be read SHAH, "to become bent..."
To the immediate left of this ligature is a small ligature that has a circle on top, a long vertical line which terminates in a horizontal line. 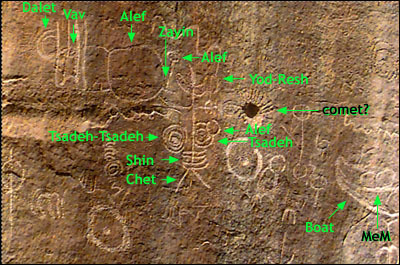 We interpret this as Alef-Zayin, AZ, "then..." and immediately to the left of this is a large circular shape, Alef followed to the left by a divided rectangle, Vav and a rare form of Dalet (doubled to indicate word ending). We read this as AVD, "to be lost or disappear..."
What we would appear to have is a portion of a story in which the authors, after debarking their ship, witnessed a bright light in the sky (possibly a comet) which had a bent tail or path and which disappeared as suddenly as it had appeared. Perhaps this was taken as a sign of some sort. Further translations will likely help fill in the gaps of this story. Viewzone has just been in contact with the No Man's Land Museum in Oklahoma and has learned that this entire panel was chalked and photographed in the 1940s by Dr. Weisendanger, first to discoverer these unusual petroglyphs in Colorado and Oklahoma. We have just asked that a set of these photographs be sent to us and will publish these, along with any revisions to our translation, as they are received. Meanwhile, we will devote our attention to some of the other petroglyphs that we photographed. The Comanche Grasslands, just south of La Junta, Colorado, offer visitors a variety of opportunities to view ancient stone artifacts. Best known for a set of set of remarkably well preserved dinosaur tracks, the Grasslands also contain several rugged canyons that harbor both Plains Indian and old Negev petroglyphs. These sights, although on public land, are rarely visited due to the strenuous climbing involved and hot, dehydrating climate. The canyon floor has little vegetation except for prairie grass. Shade trees are a rare occurrence. Our expedition sported specially made back packs filled with water (Camelbak) that served as our life-support during 20 mile treks, loaded with electronics and batteries, in the 100 degree sun. At one location we were presented with a collection of huge rocks that had broken off the high cliffs and tumbled to the canyon floor. These house-sized rocks had been randomly stacked eons ago to form a shelter from the sun. We gravitated towards this area for a spot to rest. Not surprising, we found these ancient shelters to be the repository of several old Negev ligatures and noted the collection of flint and worked stone surrounding them. This was likely what has been called an "activity center." As we approached the area we spotted a ligature that resembled an armless figure with something protruding from its head. But this was no figure. Reading from the top to bottom, the letters were discernible as Resh- Nun- Tsadeh- Lamed- Lamed, which translated into RAN-TSEL, "Rejoice! Shade." The top character (Resh) pointed towards the overhang where we found relief from the hot sun. The "legs" of this figure incorporated the double letter (Lamed), indicating the end of the phrase. What was in the rocky shelter? Well, that's another adventure we look forward to taking as we meticulously examine and enhance our digital images.